This week while wallowing in sinus infection and stomach bug grossness, I didn't feel much like physically organizing anything. I took a few days off from projects and cleaning to pretend to rest and take care of myself and to care for a vomitous MM3...love his heart! He kindly shared his sinus infection with me, but thankfully for the rest of us, he kept his stomach virus to himself. 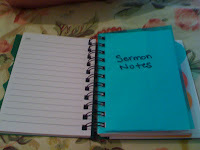 So as I was being as inactive as possible, I decide it was a good time to get spiritually organized. As busy moms, we often don't have that 30 minutes of spiritual alone time that so many professionals recommend. Frequently, I find myself spending my personal time with the Lord in the shower, car, and just as I am drifting off to sleep. I even fall asleep in the middle of my nightly prayers!!! Does God really have a clue what I'm trying to say???? "Dear Heavenly Father, Thank you for the blessings of this day and for... ZzZzZzZzZ... and I pray that you will help me... ZzZzZzZzZ..." Yes, he actually does know the desires of my heart because of my 30 second snippets throughout the day and bedtime prayers with my boys and I think he appreciates my intentions. However, I am attempting to rework my "spiritual style" so that I can take full advantage of my personal time with the Lord. Along with my 30 second snippets, I would also like to incorporate AT LEAST 15-20 minutes each night to reflect and talk to God. I read my devotionals, sometimes with the Yard Man and sometimes alone. 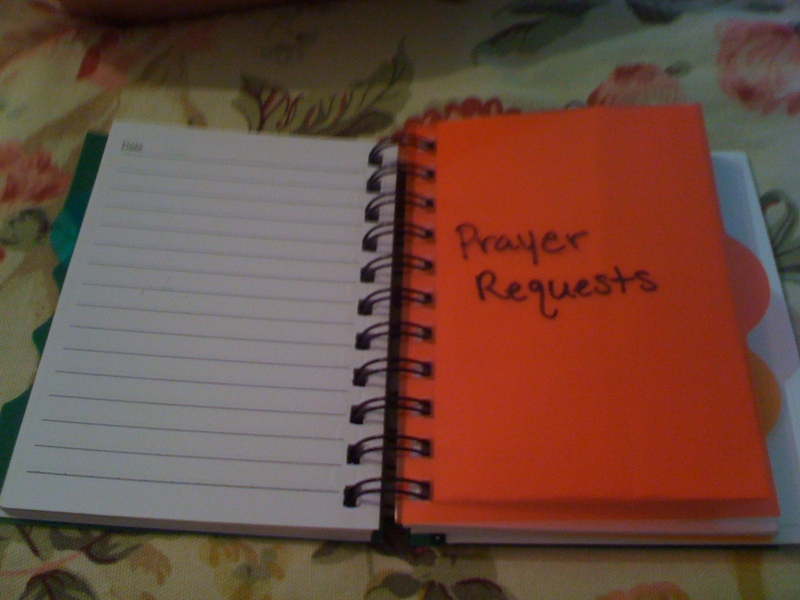 I try to remember all the prayer requests I've received throughout the day/week and I try to give thanks and talk to Him about my heart's desires. Sometimes I am just so tired and I can't seem to squeeze it all in. I know "God hears amen where ever we are" but I'd like to devote a little more time and energy to Him and not always give Him my left-overs! I'm not that person who is going to get up 30 minutes earlier each day...NOPE I am not. So this is my PLAN!!! 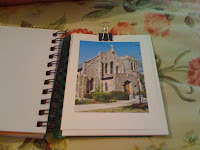 Carry my pocket Prayer Journal in my pocketbook for handy note taking and jotting down prayer requests, sermon notes, bible study notes, etc. 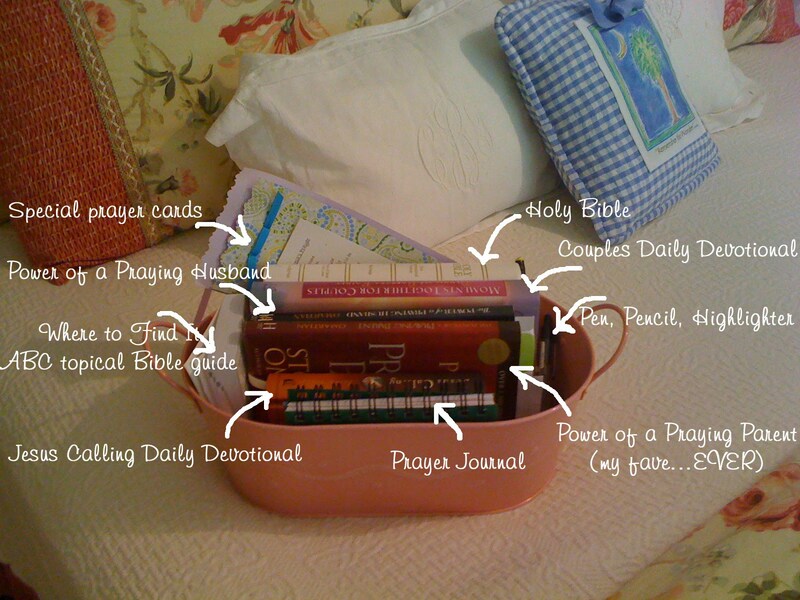 Keep all devotional materials handy in my newly organized DEVO-BIN on my bedside table! 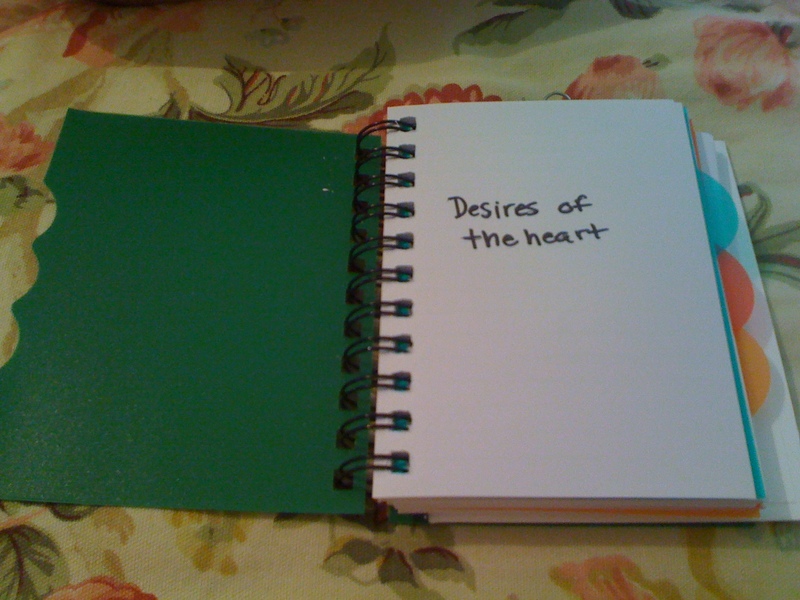 Which brings me to the DEVO-BIN. One of my books suggests a basket in which to store all your spiritual references. Thankfully, this chapter spoke loud and clear to me, as all my books, notes, pens and highlighters regularly stay in a jumbled mess on my bedside table. 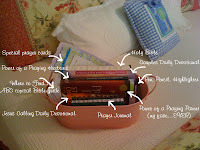 I didn't have a basket, nor would a basket fit on my bedside table, so I used this smaller metal bin I had on hand. It worked perfectly! Any who...I am very pleased with how functional and PRACTICAL it turned out. I love my DEVO-BIN!!!! 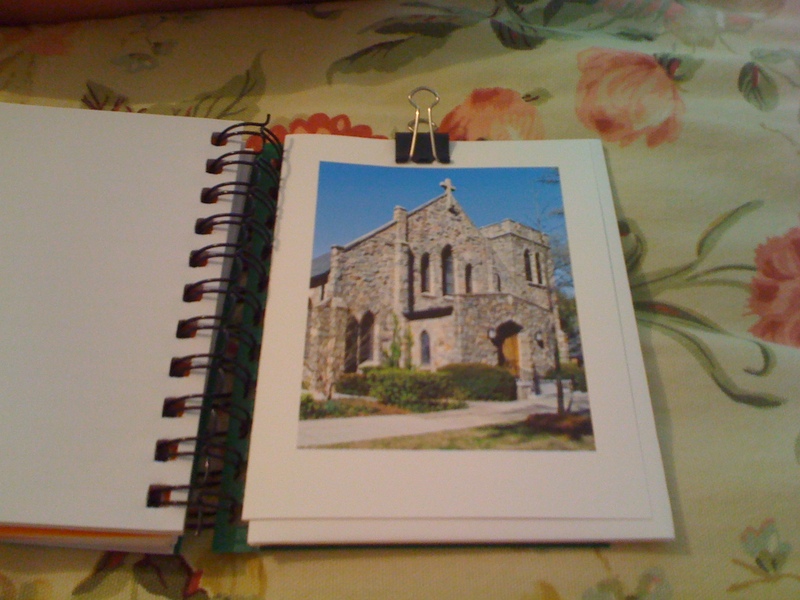 So...on to the Prayer Journal! 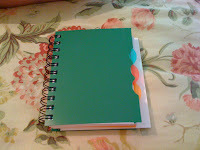 This particular org book also suggested a small spiral notebook with dividers to serve as a Prayer Journal. I found mine at the dollar store and it worked perfectly. The author has hers laid out differently but thinks the reader should personalize hers according to her lifestyle and needs. Tab #3- Prayer Requests- I finally have a designated place to write down all the prayer requests I receive from email, facebook, bible study, church, friends and family. I always feel so bad when I realize the next day that I left someone out! Hopefully, that won't happen anymore! Note Cards clipped to the back cover for writing notes offering words of encouragement to others and those on the prayer request list. Practical Tip- Just as God allows us to come as we are and fills us with purpose, go find that unused basket or bin, dust it off and wipe it out and make your own DEVO-BIN. Set the stage for regular well-deserved moments with our Lord and Savior! Girl! I love your devotion bin! What a great way to keep all your Bible/devotion books neat and not stuffing them in a drawer and forgetting! Can you send me the "gimme" printable! I need a schedule for me and the kids too...and I loved yours! Thanks for sharing! Wonderful ideas! XO! Love Love Love this! I'm following the blog- Inspired to Action- and one of the things I'm trying to do is maximize my mornings. This is my goal- to have a 30 min am devotional before my 2yr old hits the floor running. 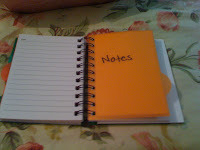 So this will help me attain the goal, because if I'm not organized, it ain't happening! Thank you!